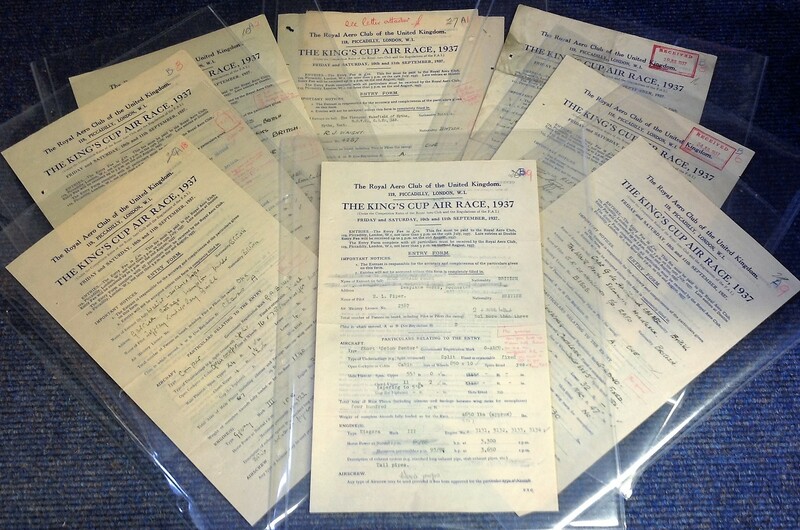 1937 Kings Cup Air Race Archive historically significant piece of Aviation history: Historic collection of the complete set of original Competition entry forms for all 31 entrants. Includes some very famous names 1. 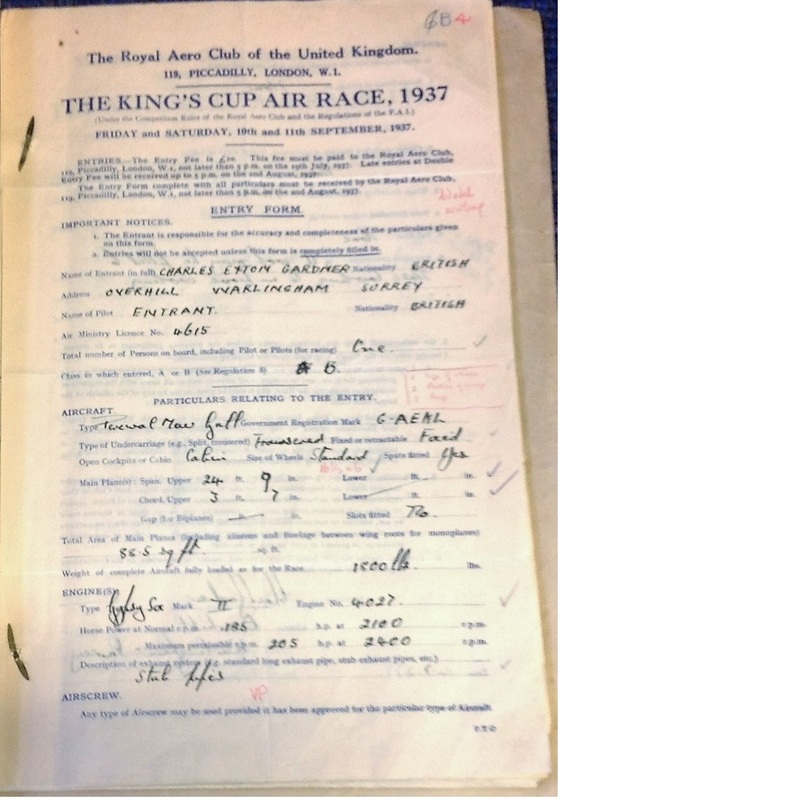 Viscount Wakefield, pilot R J Waight application signed by Sqn Ldr Clapp De Haviland Aircraft company, flying DeHaviland Low Wing Monoplane GAETK. 2, Frederick G Miles signed flying Civil plane GAFAW. 3. Countess Wakefield, pilot Capt Edgar Percival signed flying Percival Mew Gull GAFAA, signed by Percival. 4. Charles E Gardner signed flying Percival Mew Gull GACSS. 5. Pilot A E Clouston signed by entrant Frederick Tasker flying Comet GAC55, this still flies and is now with the Shuttleworth collection. 6. Alex Henshaw signed flying Percival Mew Gull GAEXF. 7. H F Broadbent signed flying BA Double Eagle GAEIN signed by entrant Victor Dupree. 8. Tommy Rose signed flying Miles Hawk Speed VI GAD9P entrant Henry Horne 9. 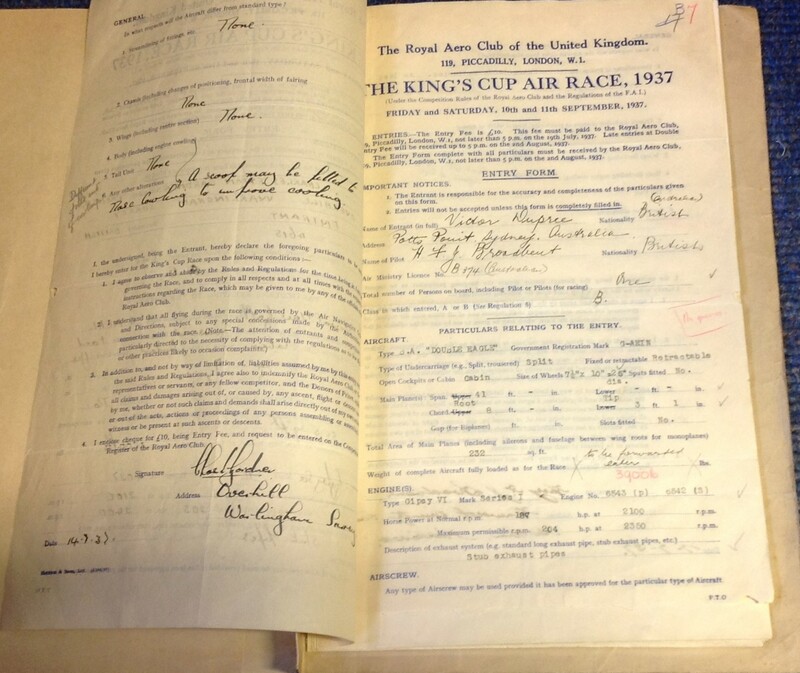 Capt Geoffrey De Havilland signed flying Monoplane Low wing GADNO. 10. Wg Cdr Stent flying Miles Sparrowhawk GADNL signed by entrant Mjr E Howard 11. Francis Butler signed flying Percival Vega Gull GAEZL. 12. Giles Guthrie flying Percival Vega Gull GAFAU entrant Sir Connor Guthrie, unsigned 13. Elsie Dillon and Capt Stack flying Percival Vega Gull GAEYD, unsigned 14. George Tonge flying Percival Vega Gull GAEZK, unsigned 15. Derek Schreiber signed flying Percival Vega Gull GAEZJ. 16. Alan Hole flying Percival Vega Gull GAELE, signed by entrant William Everard MP 17. H F Broadbent signed flying BA4 Double Eagle 18. Walter Lawrence Hope signed flying Comper GABWH. 19. H L Piper flying Short Scion Senior GAECU signed by entrant H O Short. 20. Stanley Lowe signed flying Comper Swift GABWE. 21. 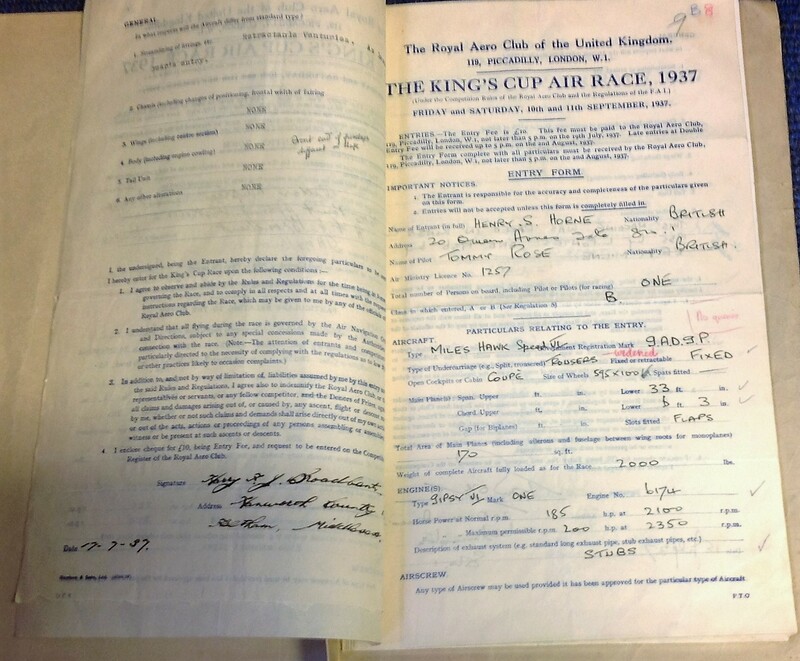 Charles McCarthy signed flying BA Eagle BK1 GACRG. 22. H H Leach flying Hendy 302 GAAVT signed by entrant Carill Napier. 23. E C T Edwards flying Miles Magister GAEZP signed by entrant Carill Napier. 24. 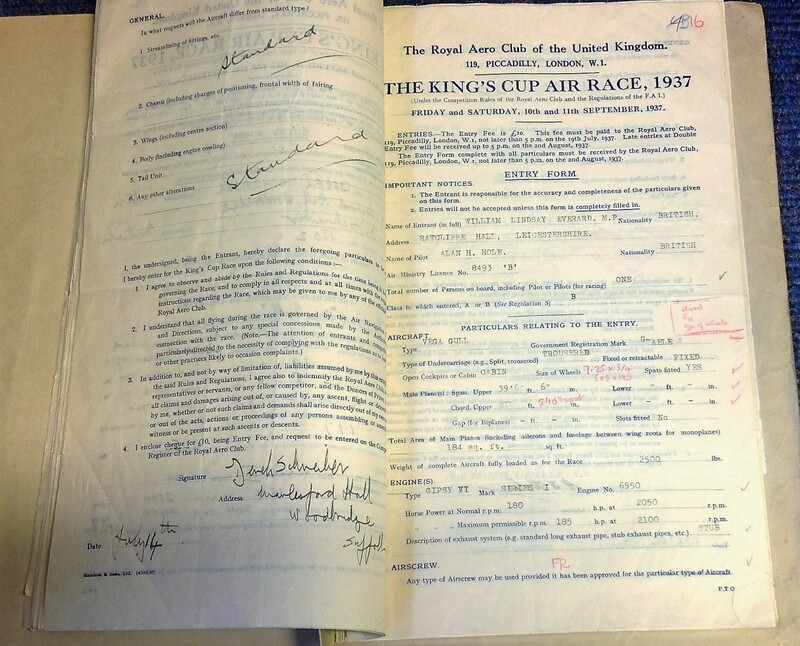 Wg Cdr E G Hilton DFC signed, flying Miles Falcon GAENG sadly killed in the race with entrant Wg Cdr Sherren MC. 25. Brig Gen A G Lewis signed flying Miles Whitney Straight GAEZO. 26, Sqn Ldr A Harvey signed flying Miles Whitney Straight GAEVH. 27. E Jobing Tusson signed flying Miles Whitney Straight GAEWK. 28. 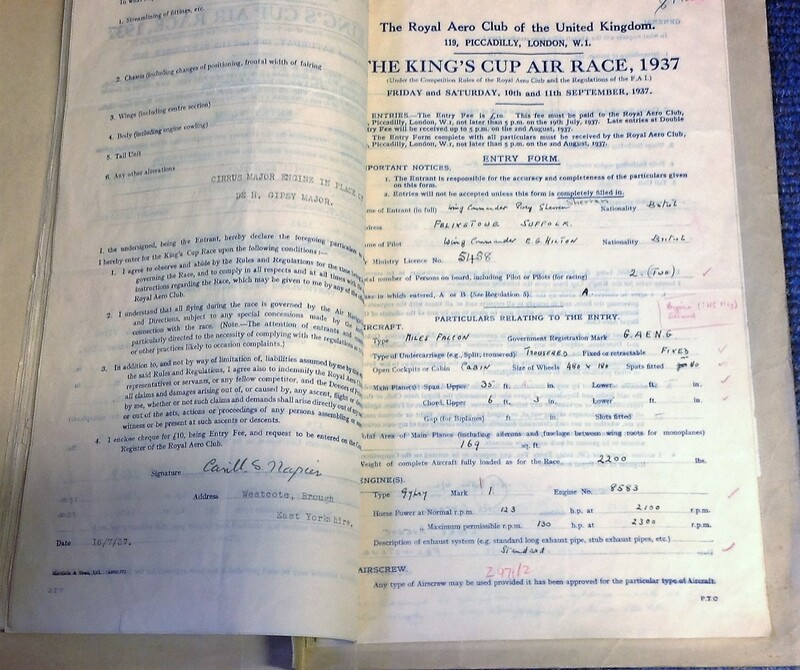 Charles Hughesdon flying Cabin Monoplane CWA Cygnet GAEMA signed Entrant James Waddington. 29. H R A Edwards flying Wicko GAEZZ signed entrant Carill Napier. 30. C H Welles flying BA Eagle Mach 1 GADID signed entrant William W Potter. 31. William H Moss signed flying Moss Monoplane GAEST. 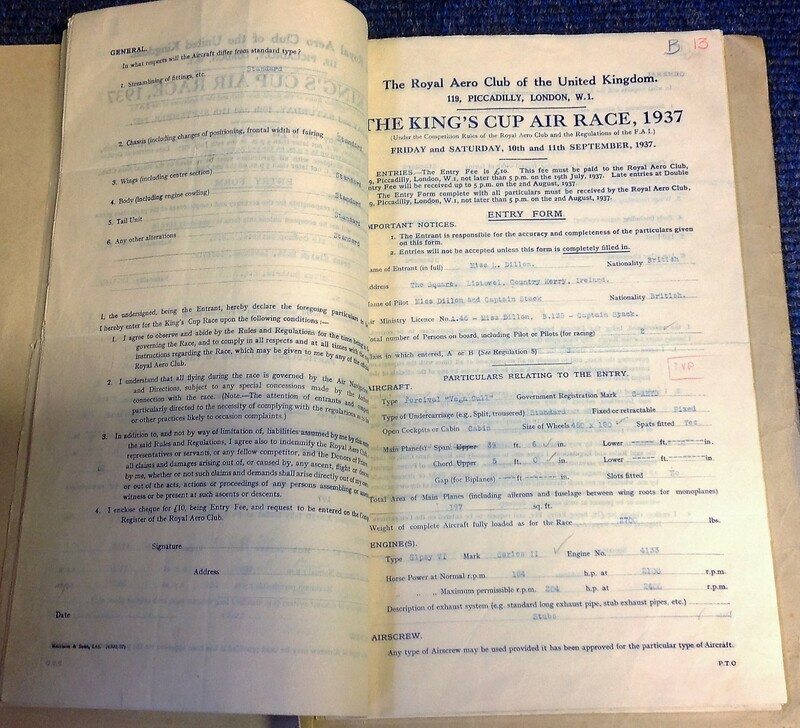 Incredible piece of aviation history uncommonly rare to find complete.